Nancy Harhut, chief creative officer for HBT Marketing, gave a fascinating talk at Deluxe Exchange 2018 (DX18). It was all about using social science about human behavior to influence buying decisions. If you didn’t make it to the conference, or if you did and want a refresher, here’s are some of the things that I pulled from her session. 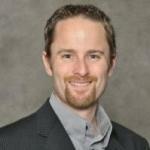 If you work in marketing today and you need to influence behavior, you have your work cut out for you. Why? One of the reasons might surprise you. It’s getting harder to reach people. Your target audience has crowded inboxes, they’re unsubscribing to lists at lightning speed, and they’ve got banner blindness. According to NewsCred, 27 million pieces of content are pumped out every day, and even if you’re lucky enough to get someone to land on your page, they’ll spend about 10 seconds there. It’s getting harder and harder to hold people’s attention. I’ve noticed this everywhere I go, if you don’t capture someone’s attention quickly, they are onto something else (usually it’s their phone). This is one of the reasons I like meeting in person with people it’s much harder to multi-task when you are face-to-face with another person. 95 percent of decision making takes place in the subconscious mind. People everywhere rely on decision-making shortcuts like an instinctive reaction. A gut reaction. People will judge whether they need your product or service based on how readily they can recall an example of themselves or someone they know needing it. So, before you ask them to buy, get them to imagine a time in the past where they really could’ve used your product or service, or a time in the future when it might come in handy for themselves or someone else. 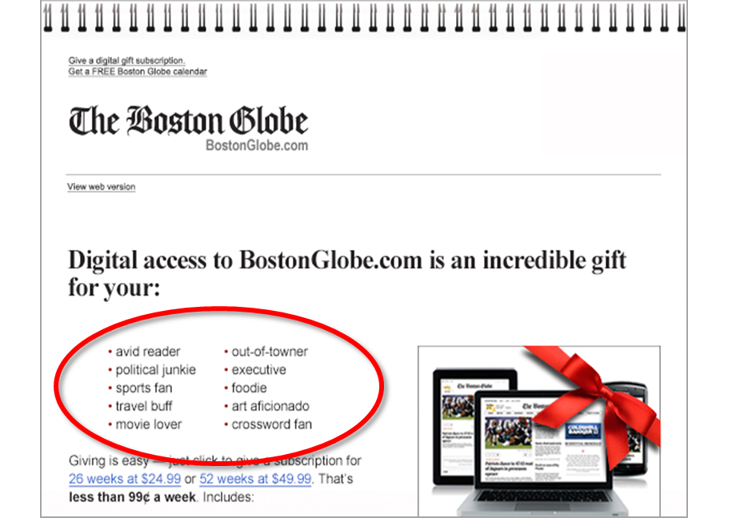 Marketing example: The Boston Globe used availability bias in a recent subscription campaign in an email that said: Digital access to BostonGlobe.com is an incredible gift for your “sports fan, movie lover, foodie, etc.,” the list went on. The email evoked images in people’s minds of friends and family who had those traits and therefore might appreciate a subscription as a gift. If something is readily available, it doesn’t demand action. Savvy marketers should look for opportunities to tell their customers products are only available to a select group of people, or only available for a short amount of time. This is a commonly used tactic in some industries, but I think often forgotten about in financial services. The challenge we must consider with scarcity is making sure we stay compliant when using this tactic. In his book, “Principles of Persuasion,” Dr. Cialdini mentions an experiment by Stephen Worchel, where participants were asked to rate the quality of cookies in a jar. Some were given a jar with ten cookies, while others only two cookies. Some people were given ten and then had their quantity reduced to two cookies. The results indicated participants who had the number of cookies reduced from ten to two rated their cookies the highest. The cookies were all identical but those who felt they were scarce enjoyed their cookies the most. Marketing example: The retail and travel industries use this tactic very effectively. Most people have experienced the situation where a hotel that they’re considering suddenly becomes fully booked just because they waited for a couple of days. 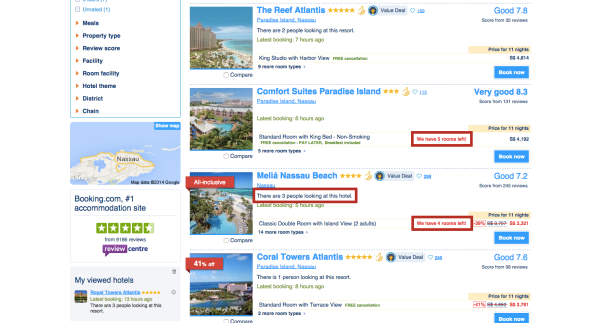 Booking.com displays how many rooms there are left for some hotels, so customers will have to hurry. To play up the scarcity game, they also indicate how many people are currently viewing the same hotel, so customers will have to act even faster. When people make a commitment to something, they’ll stay with it with little or no thought. If marketers can get that first “yes,” it’s much more likely they’ll get a second, third and fourth, especially if the first “yes” is for a relatively small commitment. Ways to do it: Ask people to make a pledge to do something, remind them of a prior yes, give a trial membership or ask them to answer questions. Marketing example: A bank sends a letter to current customers saying: Because you’re already a valued customer of ours, we’d like to let you know about a new product we’re offering. This was the most eye-opening one for me! Science offers a great explanation of why it’s so hard to get people to part with their money: The same part of your brain that gets activated when you feel physical pain is activated when you spend money. So, the way customers perceive the price of what you’re selling matters because if it seems cheaper, it’ll hurt less to buy it (at least they think it will). It’s about the size of the font, placement on the page, color and a whole host of other factors. Marketing examples: This one plays out in a variety of ways. I’ll share two examples. The price, $120, can be displayed differently ($120 vs $120.00), the way its printed can make a huge difference in how expensive people think the item is. While the two prices are the same, $120 feels cheaper than $120.00 to consumers. If you want people to think your item sounds cheaper, drop off the .00 from the price. Another example is bundling. Cable and telecommunications companies use this technique better than anyone. The ad below, from Verizon, tries to upsell people who are interested in one or two services. By offering three services together for less than the cost of two services, they can get more money from consumers while keeping business from their competition (making it less likely for them to steal the business later). It’s a win-win for everyone involved. She closed with what she calls her Neuro 9. Nine rapid-fire art and copy tips for advertising, marketing, and other materials. She talks about the impact of color, using numbers, charts and graphs, rhymes, and more. It was hard to keep up with all the tips and suggestions that came flowing out during this 45-minute session. So, there’s a recap of Nancy’s presentation from Deluxe Exchange 2018. Fascinating stuff, right? If you get a chance to see Nancy speak in person, I would carve out time for her session. It will change the way you think about how you are communicating with your customers and prospects. If this sounds interesting, you should consider attending Deluxe Exchange 2019.